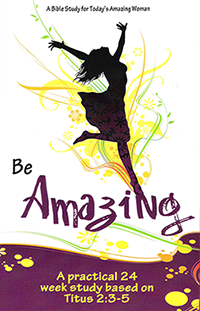 Watch an introduction to the Be Amazing Bible study, and be amazed by what God can do in the lives of young women. This outstanding 24-session DVD study has been produced by Big Dream Ministries in response to Titus 2:3-5. “Older women…encourage the young women to love their husbands, to love their children, to be sensible, pure, workers at home, kind, being subject to their own husbands that the word of God may not be defiled. It is designed for young women who want to learn more about their Biblical role as a woman, and for older women who want an excellent tool to help them mentor younger women. Each session is introduced by nationally recognized Christian comedian, Anita Renfroe. Using personal illustrations and heart-warming commentary, teachers Pat Harley, Michele Helms, Eleanor Lewis, Traci Martin, Robin Rosebrough, and Linda Sweeney share what it means to be an Amazing Woman in today’s world.